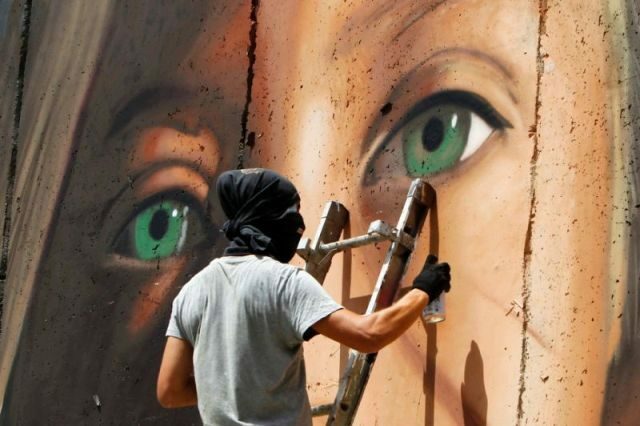 Israeli forces have arrested two Italians for drawing a giant mural of a Palestinian teenager seen as a symbol of resistance on the separation wall in the occupied West Bank, police said. The roughly four-metre (13 foot) image near Bethlehem in the West Bank depicts Ahed Tamimi, 17, who was released from prison Sunday after an eight-month sentence for slapping two Israeli soldiers, an episode captured on video. On Saturday, Israeli border police arrested two Italians and a Palestinian “on suspicion of damaging and vandalising the security fence in the Bethlehem area,” a statement said. The three, whose faces were masked, “illegally drew on the wall, and when border policemen took action to arrest them, they tried to escape in their car, which was stopped by the forces,” the statement said. On Wednesday, a man drawing the mural had identified himself as Italian street artist Jorit Agoch. A message was posted to a Facebook page under his name saying he had been arrested and pleading for help. On Sunday morning the three were still being held by Israeli forces. Palestinians see Tamimi as a symbol of resistance to Israeli occupation of the West Bank. For Israelis, Tamimi is being used by her activist family as a pawn in staged provocations.